Word on the grapevine is there's loads of benefits to having an online trade account with us (if you haven't heard - check out why you should get one here). If you've heard the rumours but aren't sure how to set one up, don't worry - we're here to help. 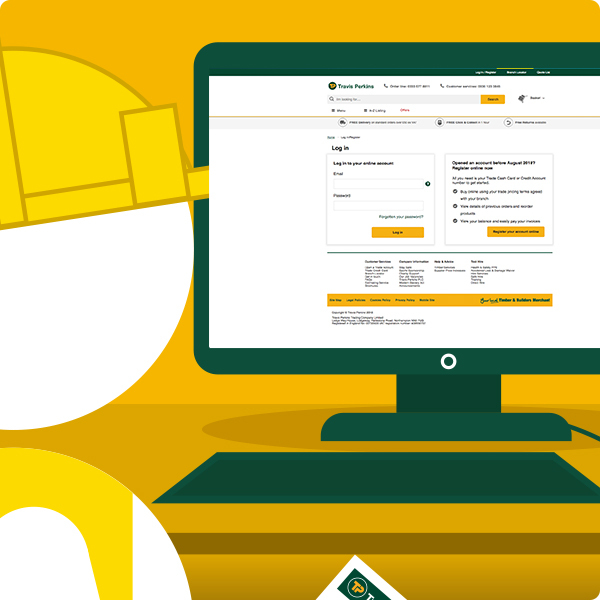 To log in and shop with us online – whilst reaping all of the rewards of being a trade customer – you’ll first need a Travis Perkins trade account: credit or cash. If you don’t have a trade account yet, don’t worry, it’s incredibly easy to set one up. Click on the heading below that best describes you to read our quick tutorial. If you already have a trade account with us but haven’t registered online – you’re missing out on loads of time and money saving perks. Here’s how you can change that. Step 1 - Visit the registration page of the website here (or the ‘Log in / Register’ button in the top right-hand corner of our website from anywhere in the site). Step 2 - Type in your account number and the postcode you used when you created your account in branch and click continue. Step 3 - Fill in some more details and create a password which you will use to log in to the website with. Click submit to create the account and you will automatically be logged in. If you created your account after the 22nd of August 2018 you will have been automatically registered for an online account. Simply visit the ‘Log in’ page here and enter your password and email to get all of the benefits of an online account. Don't worry if you've forgotten your password, there is an option to reset it, just follow the instructions. If you can’t remember when you created your Travis Perkins account give our customer service team a call on 0330 123 3846. Don’t have a trade account with us? There’s loads of reasons to get one (see them here). We offer a choice of two types of accounts: cash or credit. Choose a cash account if you prefer to pay upfront or a credit account to buy now and pay later. Find out how to get each one below. Step 1 - Visit www.travisperkins.co.uk/openAccount and select the ‘cash account’ button, fill in your details on our online form. Step 2 - Select how you want to receive offers and news from us (don’t worry, we won’t spam you if you do and we won’t be offended if you don’t). Step 3 - Click ‘Submit’ – you’ll then receive an email confirmation. You can now use your email address and password to log in, view your prices and buy online straight away. Step 2 - Download and print the Credit Account Application form. Step 3 - Fill in all of the relevant fields in BLOCK CAPITALS and black ink. Step 4 - When you’ve filled it out, pop into your local branch (don’t have one yet? Click here to use our branch locator) with pages 1 and 2, or post it to our Head Office (New Accounts Department, Harvey’s Building, Lodge Way House, Harlestone Road, Northampton, NN5 7UG). Step 5 - We know it’s not the most exciting read but keep the T&Cs on pages 3 and 4 in a safe place for future reference. Step 6 - We’ll be in touch as soon as possible. If your application is successful, we’ll send over your credit account number by email. Once you have your credit account number, you can register for your online account. If your application isn’t successful don’t worry, you can still sign up for one of our cash accounts. If you’ve no idea if you have an account with us, answer the questions below to find out. Have you shopped with us in-branch? Yes – do you know your account number? No – to find it, simply check any of your Travis Perkins receipts or invoices. Don’t have one to hand? Call your local branch or our Customer Service team on 0330 123 3846 between 8am and 5pm Monday to Friday - they’ll be happy to help! Now that you're sorted, you've got all the perks of a Travis Perkins online trade account at your fingertips. If you've got any questions, don't forget you can give us a call on 0330 123 3846 or pop us an email at customerservice@travisperkins.co.uk - we'd love to hear from you.